Simple in design but diverse in application, wedges can be used to separate objects, split material, level equipment, or align surfaces. 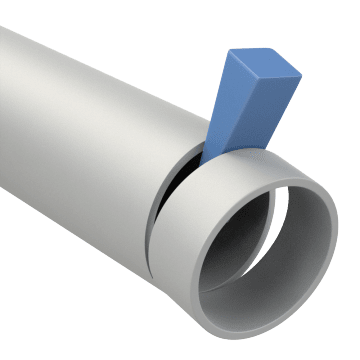 Also known as flange or set-up wedges, these tools have a tapered body with a thin edge that can fit into tight spaces for tasks such as removing flanges from pipes or splitting wood planks. They can also be inserted under machines to lift and level them or under workpieces to align them on a machine for welding, planing, or milling. Wedges are typically hit with a hammer or mallet to drive them into the area that needs separation and alignment.